Flu and complications linked to it kill hundreds of people in the UK each year. But despite massive investment in research into the virus, there is no cure. However, there are vaccines which have some protective effect. These are normally administered to the elderly and the vulnerable each year. 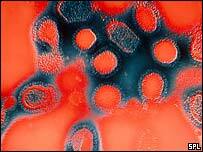 But every few years a new strain of flu appears which spreads so rapidly that precautions cannot be developed in time. This can lead to pandemics which threaten millions of lives. The worst flu pandemic this century was the Spanish flu pandemic of 1918 which killed an estimated 40 million people - more than World War One. Many people confuse flu with a common cold. There is a big degree of crossover between the two. Both are caused by viruses. Flu tends to have a more sudden on-set than a cold. Both colds and flu tend to last for about five or six days in a normally healthy person and are transmitted in similar ways - cough, sneezing and fingers made dirty from being poked in the nose and eyes. There is a temporary vaccine against flu and those most likely to benefit from it include the elderly, people with damaged immune systems and the very young. These people are at greater risk of serious complications that can be fatal. For the majority of people with flu, however, the symptoms can be treated with bed rest and over-the-counter drugs. The most difficult symptoms to treat are aches and pains, high fever and a lingering cough. People with a high fever and muscle pain should rest in bed. This should relieve the aches and pains and will ensure the virus is not spread. Antibiotics are not effective against flu viruses, but aspirins can be taken, although not by children with the flu. This is because they could be at risk of developing Reye's syndrome, a neurological disorder which is linked to aspirin use by the young. Antivirals are drugs which can be given to high risk patients who become ill with seasonal influenza and they are only effective if taken within 48 hours of onset of symptoms. They are not a cure but and may help limit the impact of some symptoms and reduce the potential for serious complications. Guidelines from the National Institute of Clinical and Health Excellence state they should only be used when the number of people with flu reaches a high level and there is good evidence that flu is "circulating in the community". For most healthy people influenza infection is nothing but an unpleasant experience. However in the elderly or people with underlying chronic health conditions, such as heart disease, it can can lead to illnesses that are more serious. According to the Health Protection Agency, the most common complications of flu are bronchitis and secondary bacterial pneumonia. These illnesses may require treatment in hospital and can be life threatening in vulnerable individuals. The influenza virus is not necessarily the cause of high mortality, but for old sick people it may speed up their death. Scientists do not know why some viruses become mass killers, but recent research suggests a molecular mechanism may allow a virus to cause sweeping and potentially fatal damage to the body. Normally influenza is confined to cells within the respiratory system, but some viruses have a unique key which unlocks the door to cells throughout the body. The new discovery could allow doctors monitoring flu viruses to spot changes which might give a virus pandemic potential. Influenza virus surface proteins alter frequently, requiring new vaccines to be developed to protect against them. The viruses are never the same each year, but normally the surface proteins undergo slight changes. More dangerous is a "shift" when two different viruses mix together to create a radically different strain. Swine influenza (or flu) is normally found in pigs, but does occasionally occur in humans. There had been no human cases detected in the UK for ten years until the outbreak that started in Mexico in spring 2009. Influenza is caused by infection with a virus. There are many types of flu virus and these are constantly changing, which makes it hard for the human immune system to deal with. The particular type of influenza virus that causes swine flu is known as H1N1, which is a type of Influenza A (there are also influenza B and C viruses). It is the same group of H1N1 viruses which cause the regular yearly flu outbreaks in humans, but swine flu is caused by different strains of H1N1. The 2009 strain of swine flu, now known as novel influenza A (H1N1), has not previously been found in pigs or humans, and contains a mixture of genetic material from human, pig and bird flu. In other words it is a new variety of flu which people are therefore unlikely to have much immunity to. Although the outbreak of novel influenza A H1N1 first appeared in Mexico, there has since been a growing number of cases reported around the world including the UK. Initially all the confirmed cases of swine flu in the UK were in people who had visited Mexico but these were followed by many more cases that have been the result of virus transmission within the UK. By the end of July 2009, cases continue to rise which is unusual for this time of year (as it isn’t typically the flu season), and doctors suspect that widespread transmission throughout the general community is likely in the next few weeks. Outbreaks of flu tend to follow certain patterns. Every year the number of flu cases rise during the winter months – this is seasonal flu. If a lot of people are affected it may be said to be an epidemic, and about one per cent of those affected are likely to die from it, usually due to complications such as a secondary bacterial infection of the lungs. But every so often, with a major change in the flu virus, it spreads rapidly around the world causing a high number of deaths. This is pandemic flu. One of the factors that scientists look out for is when a new strain of flu arises among animals and spreads to humans, changing again to develop the ability to spread from human to human without any contact with the animals. In the early stages it can be difficult to predict how dangerous a new strain of flu is and whether it could cause a pandemic. It’s still unclear exactly how severe this novel H1N1 flu strain is going to prove to be but as numbers of cases rise, the World Health Organization (WHO) has declared it a pandemic. However, initial laboratory studies suggest that novel H1N1 is a relatively mild strain and that further mutation of the virus would be needed to cause severe problems. This is being confirmed by the clinical picture as most people with swine flu are experiencing a relatively mild respiratory illness. It’s not clear why it caused particular problems in Mexico where a higher proportion of people died. Many of these people were previously fit young adults, and the WHO have suggested that pre-existent immunity to this new virus is low or non-existent, or limited to older people (who don’t seem to be so badly affected by the virus). There have so far only been a comparatively small number of deaths in Europe, although some experts suggest that there could be a second, more deadly, wave of the virus next winter. The virus does seem to be more contagious than seasonal influenza, with up to twice as many contacts of those affected developing the disease. But overall, novel H1N1 is thought to be far less dangerous than the H5N1 strain of bird or avian flu which has caused so much worry in the past few years. Although anyone can catch flu, seasonal flu tends to cause more problems among the elderly, the very young and the chronically ill. However pandemic flu tends to affect previously healthy adults – this has been the case with novel H1N1 (swine flu) where many victims have been younger adults. Initially in this outbreak of swine flu humans picked up the virus through contact with pigs but now it is being passed from human to human in most countries. This is probably occurring in the same way as seasonal flu, through coughing and sneezing which generates an aerosol of virus particles into the atmosphere that can spread for up to a metre, or through contact with contaminated surfaces such as door handles. Those living in close proximity to someone with the infection are at greatest risk. High fever (usually above 38 ºC). Chills and shivers despite fever. It can be difficult to tell mild flu from a cold but it is usually more generalised (the symptoms of a cold tend to be limited to the head while the flu causes aching and fatigue all over) and more severe with higher fever. If complications such as pneumonia develop there may be other symptoms such as difficulty breathing. The symptoms and signs in an affected person are usually enough to suggest that flu is to blame, but it can be confused with other viral illnesses. Laboratory tests are needed to formally confirm the diagnosis and, more specifically, identify exactly which strain of flu it is. A number of tests can be done in the laboratory to identify flu, using swabs or washings from the nose or throat for example. These can give results within 15 minutes but may not identify the exact strains of flu involved, only that influenza type A or B is present. These rapid tests are only 50-70 per cent sensitive for detecting flu and so may give a negative result when a person does in fact have flu. More reliable tests, which also identify exactly which sub-type or strain of flu is present, may involve growing or culturing the virus in the laboratory, and can therefore take a couple of days to give a definite result. These tests may be needed to confirm a specific strain such as swine flu. However, as the infection has become more widespread the Department of Health has advised doctors to stop testing and simply treat those with symptoms straight away with anti-viral drugs. If you think you have developed flu-like symptoms, you should stay at home and avoid contact with other people. Contact the National Pandemic Flu Service who will use a checklist to diagnose if you have swine flu. If diagnosed, you will be given a voucher number for a ‘flu friend’ to get anti-viral drugs from a collection point. These drugs include Tamiflu (Oseltamivir) or Relenza (Zanamivir). Novel H1N1 (swine flu) seems to respond to these medicines in the same way as seasonal flu. Pregnant women, people with health conditions and the under-ones will still all be referred to their GPs. The treatments are not a cure but can reduce the risk of infection for those who have been exposed to the virus, reduce the ability of a person with the virus to pass it on, and shorten the course of the illness when someone has flu. Most importantly these drugs treatments reduce the risk of serious complications and death. For maximum effect, the drugs should be given as early as possible to someone who has the flu. Treat symptoms as they arise. Try to keep well hydrated with plenty of clear fluids. Take paracetamol or ibuprofen (children should not be given aspirin because of the risk of Reyes syndrome) for aches and pains, and use simple remedies such as cough syrups and vapour rubs. Try to rest as much as possible. Although research is well underway, there is not yet a vaccine specifically for the strain of H1N1 swine influenza virus which has caused the 2009 Mexico outbreak, and it will take several months to develop one. It’s not yet clear whether current flu vaccines may offer a degree of protection. Use tissues and dispose of them carefully. Clean hard surfaces regularly with a standard cleaning fluid. Avoid close contact with people who have fever and a cough. The effectiveness of wearing a face mask in preventing transmission of the flu virus isn’t yet clear, although it may give some protection to those people such as health professionals who work closely with someone with symptoms of flu. Don’t worry about eating pork products – there is no evidence that swine flu can be picked up that way. Even if virus is present in the meat, thorough cooking will destroy it. If you want further information on swine flu, visit the National Pandemic Flu Service, the swine flu page on the NHS Choices site or the websites of leading health and research organisations such as the World Health Organization or the UK Health Protection Agency. This article was last medically reviewed by Dr Gill Jenkins in July 2009.